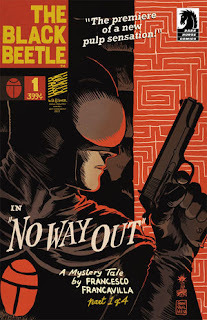 The Fellowship was fortunate enough to obtain a copy of THE BLACK BEETLE: NO WAY OUT #1 from Dark Horse Comics. Francesco Francavilla writes and draws. Beetle has an opportunity to solve a lot of crime problems in one fell swoop. Two bosses in one place is very tempting, and someone manages to beat Beetle to the punch. Now he wants to know who and why. But finding out may be harder than he expects when he ends up on a prison island with the cops hot on his trail. This first issue jumps right into the action, which is a great choice. He narrates until we catch up, basically, and then he uses detail in the artwork to fill in some of the gaps. The story hints at a fun and mysterious bad guy, too. Someone certainly seems to have it in for the crime lords of Colt City. But Beetle is on the case now. I’m really enjoying the renaissance of pulp heroes we’ve seen lately, and the Black Beetle is yet another quality installment of that movement. I’m looking forward to keeping up with this one. THE BLACK BEETLE: NO WAY OUT #1 is available now at your FLCS or by order from darkhorse.com.